Being sober is not a temporary state of being. It is a commitment, a lifestyle, and a choice. If you are battling an addiction to drugs or alcohol, then your plan to get sober should include a plan to stay sober long-term. The five proven long-term sobriety tips below can help you achieve your goal of a permanent commitment to your health and wellness. Stick to a Healthy Routine. Prove to yourself that your life is full without drugs and alcohol, and be consistent with behaviors and choices that foster a healthy mind and body. Get regular exercise, eat healthy and nutritious meals, meditate, get seven to nine hours of sleep every night, and spend time with friends and family who support your quest for sobriety. To further ensure you have the necessary support system in place to change your mindset and your habits long-term, seek the support of a 12-step program, an outpatient treatment facility or an AA support group, and your doctor, and don’t skip any appointments or sessions. Continually having reminders in your life for why you have chosen sobriety will keep you committed and focused. Be Honest with Yourself and Those Around You. Your past substance use disorder and current sobriety are nothing to feel shameful about our to hide. Harboring feelings of shame could lead you into a relapse. Instead, change your mindset and be proud of your courage and your commitment to sobriety. 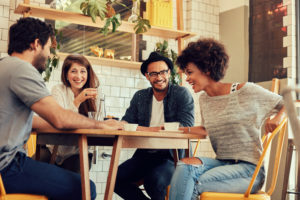 When appropriate, and especially in social situations where others are imbibing, share with friends, family, and co-workers that you are recovering and committed to long-term sobriety. Saying it out loud will hold you accountable and feeling the support from those around you will strengthen your resolve. Minimize Temptations. If there are people in your life who may tempt or encourage you to forget your sober pledge, minimize your exposure to them. This decision may mean cutting out people in your life that you consider friends—or even a significant other—but nothing and no one is more important than your health and well-being, and anyone who isn’t supportive of your choice to be sober isn’t someone who deserves a place in your life. Give Back to Others. One way to stop over-analyzing how you feel about your life, your body, and your habits is to focus on others. Get involved with a cause that matters to you. Volunteer for a non-profit in your community or find a passion project into which you can immerse yourself. By focusing on the ways you can make a difference in the world, you will realize you deserve to be cared for and will be more motivated to allow yourself to heal and recover. Practice Abstinence. Whether you have been sober for six weeks, six months, or six years, there is no reason to test your resolve. Even if you’re about to toast your daughter and new son-in-law on your wedding day, avoid all alcohol, or your former drug of choice. Drugs are addicting for a reason, and even after a time away they can fool your body and mind into thinking that just one more sip or one more hit can’t hurt, but for a recovering addict, just one more could be deadly. Remember that long-term sobriety doesn’t have to mean the absence of something in your life. It means choosing life—your life—over everything else and leading a lifestyle that is wholly satisfying, which is something to gain.